People are always asking me if I cook fancy meals for Mr. Tofu and myself every night. I guess folks assume that just because I’m a food writer/recipe developer, I breeze into the kitchen nightly and whip up insanely complicated meals all the time. Um, no. There are often nights when I make the 5-pace commute from my office to our outdated kitchen and can barely get up the gumption to use a can opener. Which is fine, except Mr. Tofu’s bar is set pretty high (as is mine) when it comes to food, so Spaghetti-O’s aren’t ever going to cut it. Enter Bucatini all‘Amatriciana. It’s one of my favorite dishes when I want something quick, interesting, and kind of spicy. From the town of Amatrice in Lazio, this quick little number highlights what Southern Italians do best—pecorino, vine ripened tomatoes, red chile flakes, bucatini (thick, hollow spaghetti), and guanciale. Wait, what’s that last ingredient? Guanciale (look away now dear vegetarian readers) is unsmoked bacon made from the cheeks of hogs. (Guancia is cheek in Italian. 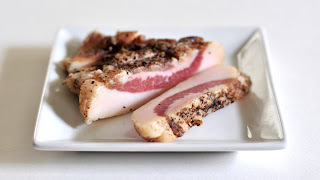 )It’s got a yummy, peppery bite, and the texture is much meatier than bacon. You can find it at gourmet shops, or substitute pancetta. But Mr. Tofu would rather eat sand than partake in guanciale. So, I add Peppadew peppers to his pasta. 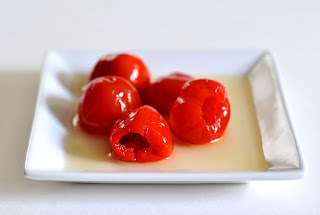 Peppadews, in case you aren’t familiar, are cherry-tomato sized seedless pickled peppers that have a nice balance of sweet and spicy flavor, and a juicy texture you can really sink your teeth into. I get them in bulk from the olive bar at my local market. With such a simple dish (just 5 ingredients), it’s important to buy the very best you can. 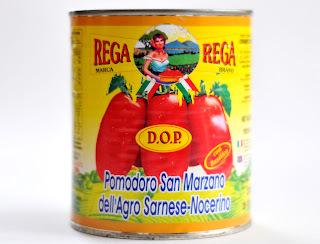 I use super-ripe tasting San Marzano tomatoes; you’ll know them by the “D.O.P” on the label (which assures they’re coming from a controlled growing area of southern Italy). I get imported Pecorino Sole di Sardegna, a mildly salty sheep’s milk cheese that doesn’t overwhelm like some pecorino romanos do, and, most importantly– the best pasta I can find. The rest is just a flick of the wrist. Buon Appetito! In a large sauté pan with lid, heat 1 tablespoon of the oil over medium heat. When the oil is hot, add the guanciale and sauté until browned, about 10 minutes. Drain off all but 2 tablespoons of the rendered fat. Add 1 1/3 cup of the diced onion. Sauté until the onions are translucent, 8 minutes. Meanwhile, in a small sauté pan, heat the remaining tablespoon of oil over medium heat. Add the remaining onions and sauté until translucent, 8 minutes. Add 1/4 of the garlic and half of the Peppadew peppers to the pan, sauté 45 seconds. Add 1/4 of the tomatoes and juice, 1 teaspoon of the oregano, and a small flick of red pepper flakes. Bring to a gentle simmer and cover. Add the remaining tomatoes, oregano, Peppadew, and a good pinch of pepper flakes to the pan with the guanciale, bring to a simmer, and cover. Simmer the sauces for 20 minutes (adding water or stock if they get too dry) . Season with salt and pepper. Meanwhile, bring a large pot of salted water to a boil. Add the pasta and cook until al dente, times vary on thickness of pasta. Drain the pasta. Add 1/4 of it to the pan with the vegetarian sauce. Add 1 1/2 tablespoons of cheese and a pinch of the parsley, toss with tongs. Toss the remaining pasta, cheese, and parsley with the guanciale sauce. Serve right now. Where do you buy your bucatini? I can never find any at New Seasons or Pastaworks. The only time I’ve been able to find it, it was only by begging the front counter person at Justa Pasta to sell from what they use in the nightly special. I love the idea of the pepadews in this dish; much more interesting than just mindlessly replacing the guanciale with a meat substitute. Sounds killer. I think I found it at Sheridan Market once. Try Costplus World Market too, I think I’ve seen it there. As you can see by the picture, I had to use fusilli for the shoot because I couldn’t find it this time either without running all over. The texture and thickness is exactly the same. Sounds great Ivy. 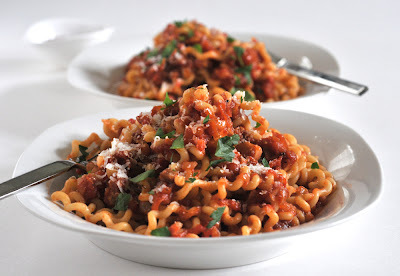 Amatriciana is one of my favorites, and I am grateful to know what Guanciale is. Thanks for a great post! Nice! I’ve got my first guanciale curing in the fridge right now. I’ll make this when it is ready in the next week or so. I got the jowl from Sweet Briar Farms in Eugene and used Mario Batali’s recipe.